The right diet can ease and even remedy some of the symptoms of arthritis. There are two kinds of arthritis. Osteoarthritis – A degenerative condition that often occurs with age. Osteoarthritis causes stiffness and pain in the affected joints. Being overweight can sometimes worsen symptoms due to the greater load on the joints. Rheumatoid arthritis – an inflammatory condition involving multiple joints. The joints often swell and cause pain. Sometimes the sufferer (typically adult women) will go through periods of remission. Unfortunately there is conflicting advice regarding diet for arthritis. Despite some clinical trials taking place, many results are considered to be a placebo affect. However there are some guidelines that may help. Oily fish – such as cod liver oil supplements, tuna, salmon, and sardines. Vitamin C – found in many foods such as kiwifruit, peaches, oranges. Turmeric and ginger – anti-inflammatory foods (use in curries, soups, or stews). Some report that a vegetarian or vegan diet has helped. Conquering Arthritis: What Doctors Don’t Tell You Because They Don’t Know by Barbara D. Allan, has many helpful tips for sufferers based on Barbara’s years of experience working with RA patients in her medical practice. Some report that vegetables from the solanum (or nightshade) family cause problems – potatoes, capsicums, eggplant, and tomatoes. Foods high in saturated fat – such as full-fat dairy, fatty meat, baked foods. The only way to find out if something is aggravating your arthritis is to constantly monitor your diet. Do this by keeping a journal of what you have eaten, and what pain you experience. If you begin to notice any patterns (such as joint pain the day after eating a certain food), you will need to try and isolate the cause. Take the food out of your diet for a week, and see if you experience the same arthritic symptoms. In order to make any correlation, you will need to do this 3 times. 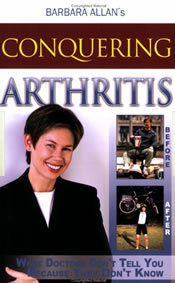 Arthritis.org – Official site of the Arthritis Foundation. www.niams.nih.gov – National Institute of Arthritis and Musculoskeletal and Skin Diseases. Allan, Barbara D. Conquering arthritis : what doctors don’t tell you because they don’t know : (9 secrets I learned the hard way. Saint Louis, Mo: Shining Prairie Flower Productions, 2009. Print. 1. The IBS Low Starch Diet (Carol Sinclair) which recommends a low starch diet – eliminating wheat / cereal products gave me a huge improvement. 2. Type 3 allergy testing and removing those intolerances from my diet. Wheat did not show up in the blood test so it is not perfect since how your body digests foods (or fails to) can’t easily be tested for. 3. The Inflammation-Free Diet (Marian Reinagel) which ranks the inflammatory effect of thousands of foods. From this I am able to balance inflammatory and anti-inflammatory foods – farmed salmon is highly inflammatory which could be why Susan can’t tolerate it (wild salmon is highly anti-inflammatory). 4. The Body Talks (Judy Cole) which explains how food is digested and used throughout the body. Fantastic, clear book that also strongly recommends eliminating food intolerances and following a low starch diet as the only way to heal your body. This book really combines all the above thinking. From this I am able to understand various foods (protein, fat, carb and starch) so that I can combine them correctly and healthily. i had RA way back 1999-2000,but I never experienced it again even until now. I choose to pick what I eat, I didn’t eat any pork or beef, just chicken meat, vegetables and fruits, I avoid fried or oily food, I just eat steamed or boiled vegetables instead.I don’t eat beans & eggplant.I usually put my hands and feet deep in a basin of warm water with a lot of salt in it. I also drink a lot of water, and of course prayers that God will heal me from RA and He did! I have just been diagnosed and wish to know which foods and drinks I should avoid. Thankyou. I am a suffer of RA, and I suffer with fibromyalgia. I am taking vinegar(tb spoon with 1/3 cp water), and soverign silver. My family suffers with diabetes and this has helped a lot. Exercise helps too, but it is hard because you are in pain. I get the swelling mainly in my fingers. If you suffer with gout, seafood tends to make it worse. Celery and vegetables tend to help. Our body is on 5% acidity, so vinegar puts back what we use. Hopes this helps! Plenty of water helps too. Pls can someone offer some advice I am 29 yr old male with arthritis in my knee and ankle and I have severe gout which I get a bad bout of 2 if not 3 times a month. I am currently on allipurinol. I finshed an antibotic the end of january and started the allipurinol. I am currently very bad again and have been put back on the antibiotic and off the allipurinol. I Have altered my diet and dont eat red meat anymore or white bread. I really am looking for other methods to help my arthritis and get an idea of foods that help. oh has anybody experienced that horroble skinsensation when somebody wants to touch you. It almost creeps me out its so bothersome!! I felt bad I snapped at my sone who was trying to hugme and rub my shoulder.!!! Ulc! Its so icky adn the sesation drives me up a wall!! There are way more than two types of arthritis. Gout type, psoriasis type, etc., etc., etc. The authors should have their names listed and/or a link to the editor beside each diet description for corrections. Thanks for helping. I had gouty arthritis three years back. I am taking alluporinol since then. Now the uric acid level is 6.5. Ther is no pain but all joints seems uneasy and some time i uneasy to close my fingers. So, please what may be the remedy. An anti inflammatory diet should include herbs, spices, and tea! I had both types of arthritis cured by having my type 3 allergies tested in a blood test, cut out all 50 foods I was allergic to and have been arthritis free for 19 months. I had very bad arthris in my knees, I could hardly walk, I now do squats. Having lived with Rheumatoid ARthritis for over 10 I can attest to the fact that diet really does make all the difference. I have, because of dietary changes, lived an active life again for the past 8 years, without all the pain and suffering associated with RA. I follow a diet very similar to what you recommend on this site, although I have a challenge with eating salmon. Isolating food groups is the perfect way to determine which foods cause the most harm for your particular body, as mentioned above.